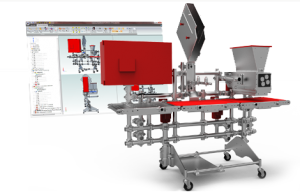 Geomagic Design (formerly Alibre) empowers your business to take product design and manufacturing to the next level. Empowering your business to get to production faster is crucial. Geomagic Design delivers efficiency from your first idea sketch to making product brochures to tracking orders. It’s an all-in-one solution streamlined to help you deliver. Turning ideas into the best products they can be is why you’re in business. Turning ideas into the best products is why you’re in business whether than means making them lighter, faster, stronger, less costly, more beautiful, less wasteful, or all of the above. Geomagic Design’s creation environment provides you the tools to design, analyze and refine your product until it’s perfect. No more fi ghting your design environment. Geomagic Design works with your engineering, marketing, sales and management teams. Benefit from incredible ease of use that boosts productivity without sacrificing power. Design, communicate and iterate more easily and faster than ever before. you want. Create and modify with ease. The interface is rich with helpful, visual tips on what various tools do and how to use them. You’ll be productive in hours, not months.